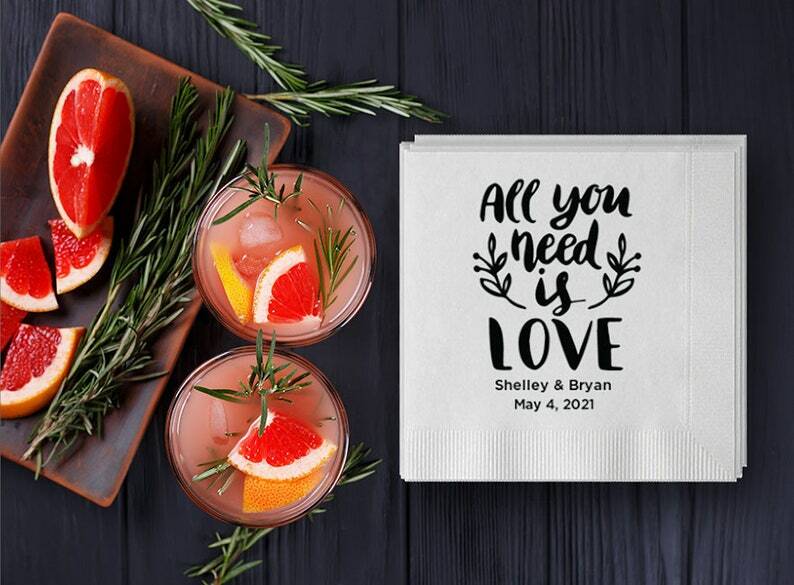 Custom cocktail napkins foil-pressed with "All you need is love" in a hand-drawn design! Names & date below. A cute & creative way to personalize your event! ▶ Clip art: #61 "All you need is love"
💛 FOIL COLORS & FINISHES: We also offer 3 types of foil: Matte, Satin and Shiny. Please see photo #4 for all available foil colors and sheens. 💚 FONTS: Choose your fonts from photo #5! 💙 CLIP ART: If you'd like to add some clip art that's different than the wreath we have pictured, please check out photos #6-10! This listing is for COCKTAIL napkins which measure approximately 5x5". ▶ For LUNCHEON or DESSERT size napkins, please see this listing: Coming soon! ▶ For DINNER size napkins, please see this listing: Coming soon! 🖤 PLEASE NOTE: Orders must be placed at least 21 BUSINESS DAYS before your expected delivery date. Rush delivery is available for an extra fee and the order must be placed at least 8 BUSINESS DAYS prior to your expected delivery date. These napkins are perfect for weddings, birthday parties, baby showers, bat/bar mitzvah's, galas, holiday parties, or any other occasion where drinks or snacks are being served! 1. PROOF REVIEW - After we receive your deposit and details, proofs will be carefully designed and emailed to you within 3 business days. Three complimentary rounds of revisions are included with each order. Cocktail napkins are not printed until we receive final approval from you. 2. PRODUCTION - After receiving final approval on your proof, we will begin production on your special order! Once proofs are approved, production & shipping begins. Total turn-around time (without a rush) from the time you place your order until delivery is approximately 21 business days (provided you respond to messages in a timely manner). Please message us if you need to rush your order. Minimum turn-around for rush (including shipping) is 8 days from proof approval. 3. SHIPPING - All orders ship via USPS or UPS with a tracking number. Shipping takes anywhere from 3-7 business days domestically, and up to 15 days internationally. Expedited shipping is available...simply select the Priority Mail Shipping Upgrade when checking out. 🇺🇸***INTERNATIONAL ORDERS: Our shipping prices are estimates and will be adjusted according to the weight of your order and your location. Item is perfect. Everything I wanted. Owner or maker is so on top of everything and very accomodating and great to talk to. Great customer service . Product is exactly as advertised! Looks beautiful ! Great products. I am very happy. All pre-designed invitation orders begin with a required $100 deposit which will apply to your order total. All custom design orders begin with a required $250 deposit which will apply to your order total. After the deposit is made (by either purchasing our listing entitled ORDER DEPOSIT or a custom deposit listing we make just for you) we will contact you to go over your needs and preferences and give you a total price for your custom package. Once we have worked together to come up with your package, the design process will begin! Please note, once we start work on your custom items, your deposit becomes non-refundable. Upon final approval of proofs, your remaining balance will be due. We will set up a private listing in the amount of your balance and you can pay at your convenience. All personalized holiday card orders begin with a required $100 deposit which will apply to your order total. After you put down your deposit, we will email you first proofs within 1-2 business days. Printing, shipping & assembly takes anywhere from 7-10 business days so please make sure to place your holiday order by December 12th. If you are late, rush shipping is also available for an extra fee - just message us! Please note: Minimum holiday card purchase is 50. Your order includes 3 rounds of design proofs. Should you choose one of our pre-designed invitation suites, the first round of proofs will be emailed to you approximately 48-72 hours after you submit all of your info, wording & design ideas. You may request changes additional times, resulting in 2 additional sets of proofs. Each set of proofs thereafter will add $25 to your final total. If you would like a custom design, the first round of proofs will be emailed to you approximately 7-10 days after you submit all of your info. We will then work with you on design revisions until we get everything exactly right! Hard copy proofs are available to be mailed to you for FREE before final design approval. Please keep in mind, these are sent via regular mail and will take up to 7 days for processing and shipping. Full payment on your order is required before printing begins. The balance will be due after proof approval and before printing. GubbaGumma is not responsible for errors on printed stationery or paper products that were approved during the proofing process. However, we are happy to reprint your stationery or paper products at a discount in the case of an error found upon delivery. A 9% sales tax will be applied to all orders shipped to California. For customized invitation/stationery orders that require proofs, there is a cancellation fee of $100 if you cancel your order after your proofs have been emailed, and therefore your deposit will be withheld. Personalized thank you cards are subject to a $25 cancellation fee. The reason there is a cancellation fee is because of the time we spend creating your custom proofs. When you place an order and commit to using our service, we immediately begin working on your personalized proofs. The design process is included in the pricing of our stationery and after it has been completed we cannot refund that part of the cost. Once you have approved your proofs and the production process has been started, you cannot cancel your order. Due to the custom nature of wedding invitations, napkins, coasters and matches, returns and exchanges are not accepted. Vintage stamps may be returned for a full refund as long as they are in their original condition. Please include the packing slip in your return package. GubbaGumma is not responsible for errors on printed stationery and paper products that were approved during the proofing process, so be sure to check your proofs carefully for spellings, punctuation, capitalization and grammar. We are happy to reprint your stationery or paper products at a discount in the case of an error found upon delivery. We must be notified of any errors within 5 days upon receiving your package. Returns based on color are not accepted. All computer monitors are different, so your printed stationery may not match what you see on your monitor. Your printed invitations will be close to the colors shown on our printed color chart, but due to the custom nature of printing, these colors can vary slightly over time and with different paper, so they may not match perfectly. We always make sure each order looks beautiful and that the color is pleasing and as true as possible. All wedding invitation samples are shipped via USPS First Class Mail (1-5 business days) unless another delivery method is chosen at checkout. INVITATION ORDERS OVER 75 SETS ship FREE via USPS Priority Mail (2-3 business days) or UPS with a tracking number unless another delivery method is noted and paid for in full. INVIATION ORDERS UNDER 75 SETS will be priced out on a case-by-case basis and added to your final payment total. NAPKINS, MATCHES, COASTERS and all other foil-stamped items must be placed at least 21 BUSINESS DAYS before your expected delivery date. Rush delivery is available for an extra fee and the order must be placed atleast 8 BUSINESS DAYS prior to your expected delivery date. VINTAGE STAMPS, CARDS & STATIONERY will be shipped within 1-5 business days, sent First Class in a rigid mailer with tracking. You also have the option to upgrade to Priority Mail (2-day shipping) or Priority Mail Express (overnight shipping). You will receive a free upgrade to Priority Mail if your total is over $100. You will receive the tracking # when your order is shipped so that you can follow your package as it makes its way to you! All Canadian orders are shipped via UPS by default due to numerous issues with USPS Priority Mail. UPS shipping takes 2-9 business days and is time definite. Brokerage, taxes and customs fees are NOT included in the shipping price and will be charged upon delivery. As the buyer, you are responsible for all import related fees. USPS Priority Mail is available upon request, but please allow 2-12 weeks for delivery if choosing this method due to frequent delays at customs. Standard shipping for international packages is via Priority Mail. The shipping estimate for Priority Mail is 10-15 business days. This is not a guarantee, but an estimate, and DOES NOT include time spent in customs. We are not responsible for any shipping delays due to customs, which may take up to an additional 6 weeks or more. Please look into the customs and import policies of your country before placing your order. We recommend ordering 6-7 months in advance of your wedding for international customers if using Priority Mail shipping. Please note for any orders other than cocktail napkins and matches we will need to calculate shipping based on package size and destination. If you place an international order for any of these other items we will contact you immediately with a shipping estimate. UPS Worldwide shipping takes 3-6 business days and is time definite. We recommend this method for shipping your wedding invitations and time sensitive stationery. Most countries charge tax and duties on imported international shipments. As the buyer, you are responsible for all taxes, duties and other charges your home country may make. Please look into the policies of your home country before placing your order. We carefully check each order prior to shipping, however, if there is a problem with your order please let us know as soon as possible and we will gladly fix it!